Phoenix, Arizona—An as-yet unidentified woman who is five months pregnant was seriously injured when her SUV was struck by a pickup truck, causing her to be ejected from her vehicle. 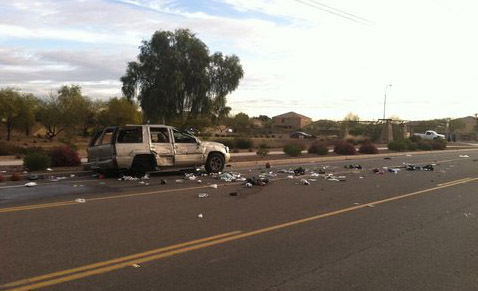 The accident occurred Monday morning at 71st Avenue and Broadway Road. The driver of the truck was turning left onto Broadway when it clipped the rear end of the SUV, causing it to spin and eject the woman. The SUV’s rear axle broke off and hit another vehicle. The woman was rushed to a nearby hospital where she and her unborn child are listed in stable condition. Maricopa County Sheriff’s accident investigators have not released the woman’s identity, as their investigation continues. None of the other people involved were seriously injured in the accident. We wish the injured woman and her child swift and complete recoveries.